Who doesn’t like the sound of that? Next Tuesday, commonly known as Fat Tuesday, or Shrove Tuesday, is also referred to as National Pancake Day in the UK and elsewhere, I’ve found. Why? Well, let me begin with Shrove Tuesday, derived from “shrive” which means “to confess.” Since it is the day before Ash Wednesday, it is traditionally a day of confession for Christians before the Lenten season begins. We get to indulge our cravings one last time before the season of Lent. In the Middle Ages, and even today, this meant giving things up, so we eat pancakes containing butter, fat and eggs, as these items were considered indulgences and typically given up during Lent. So the idea was to use up these ingredients so that they wouldn’t be around in the kitchen during the fast. In England, there are also pancake tosses and pancake races commemorating the day. According to legend, in the 1400s in Olney, England, the shriving bell began to ring, and a woman, fearful of being late, ran to the church, still holding the pancake pan. 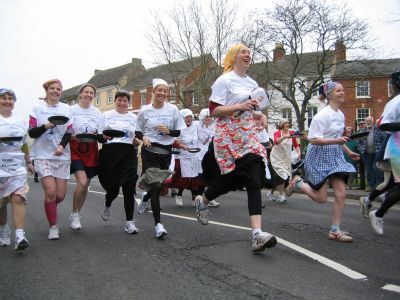 A pancake race was born, where participants must flip a pancake a certain number of times while racing from point A to point B. According to my web research, this still take place today in Olney. You must be an Olney resident female to participate and wear an apron and hat or scarf. You must toss your pancake at least three times; the woman arriving first at the church with a pancake to serve to the bell ringer is the winner. Today women also can raise money for charities as they race. The annual Pancake Grease is held at the Westminster School in London. A verger from Westminster Abbey leads a procession of boys into the playground, where a cook tosses a huge pancake across a five meter high bar. The boys then run to grab a portion of the pancake. The boy who ends up with the largest piece of the pancake receives a cash bonus from the Dean. So this Tuesday, have a pancake.